The main treatments for heart failure are making lifestyle changes and taking your medicines. However, there are procedures and surgeries that may help. 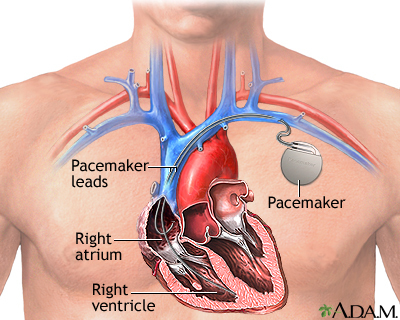 A heart pacemaker is a small, battery-operated device that sends a signal to your heart. The signal makes your heart beat at the correct pace. To correct abnormal heart rhythms. The heart may beat too slowly, too fast, or in an irregular manner. To better coordinate the beating of the heart in people with heart failure. These are called biventricular pacemakers. When your heart is weakened, gets too large, and does not pump blood very well, you are at high risk for abnormal heartbeats that can lead to sudden cardiac death. An implantable cardioverter-defibrillator (ICD) is a device that detects heart rhythms. It quickly sends an electrical shock to the heart to change the rhythm back to normal. Most biventricular pacemakers can also work as implantable cardio-defibrillators (ICD). The most common cause of heart failure is coronary artery disease (CAD), which is a narrowing of the small blood vessels that supply blood and oxygen to the heart. CAD may become worse and make it harder to manage your symptoms. Blood that flows between the chambers of your heart, or out of your heart into the aorta, must pass through a heart valve. These valves open enough to allow blood to flow through. They then close, keeping blood from flowing backward. When these valves do not work well (become too leaky or too narrow), blood does not flow correctly through the heart to the body. This problem may cause heart failure or make heart failure worse. Heart valve surgery may be needed to repair or replace one of the valves. Some types of surgery are done for severe heart failure when other treatments no longer work. These procedures are often used when a person is waiting for a heart transplant. They are also sometimes used long term in cases when transplant is not planned or possible. Examples of some of these devices include left ventricular assist device (LVAD), right ventricular assist devices (RVAD) or a total artificial hearts. They are considered for use if you have severe heart failure that cannot be controlled with medicine or a special pacemaker. Ventricular assist devices (VAD) help your heart pump blood from the pumping chambers of your heart to either the lungs or to the rest of your body These pumps may be implanted in your body or connected to a pump outside your body. You may be on a waiting list for a heart transplant. Some patients who get a VAD are very ill and may already be on a heart-lung bypass machine. Total artificial hearts are being developed, but are not yet in wide use. Devices inserted thru a catheter such as intra-aortic balloon pumps (IABP) are sometimes used. An IABP is a thin balloon that is inserted into an artery (most often in the leg) and threaded into the main artery exiting the heart (aorta). They are used in people who are waiting for recovery or for more advanced assist devices. Aaronson KD, Pagani FD. Mechanical circulatory support. In: Mann DL, Zipes DP, Libby P, Bonow RO, Braunwald E, eds. Braunwald's Heart Disease: A Textbook of Cardiovascular Medicine. 10th ed. Philadelphia, PA: Elsevier Saunders; 2015:chap 29.